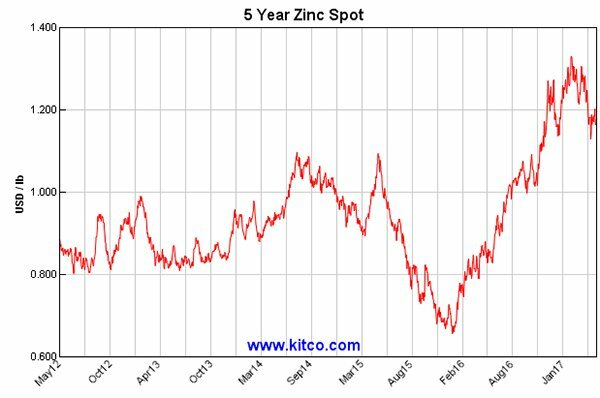 Based on a current five-year pricing picture zinc is by far the best performing base metal. In a period of fluctuating fortunes and unpredictability in the base metals space, it could be argued that examining the commodity’s performance over a five-year term is a better guide. 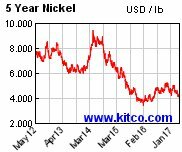 Over five years, the zinc price has increased by approximately 40% with lead at 22%, copper 15% and nickel virtually line ball with where it was five years ago. While the often overlooked lead could be viewed as somewhat of a surprise packet, it does tend to track the zinc price closer than the other metals. 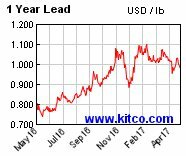 This is even evidenced in the last 12 months when lead has increased approximately 25% from circa US$0.80 per pound to its current level of US$1.00 per pound, having recently traded as high as US$1.10 per pound. 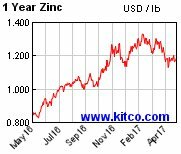 Zinc’s 12 month performance is even better having increased from approximately US$0.85 per pound to its current level of US$1.20 per pound, representing a gain of 40%. 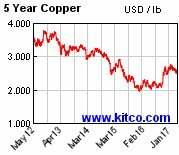 It was by far the best performing base metal in calendar year 2016, and while some analysts were suggesting a retracement was imminent in 2017, that hasn’t come to pass as it surged even further from approximately US$1.15 per pound to nearly US$1.35 per pound in the first two months of 2017. However, it should be noted here that commodity prices do fluctuate and caution should be applied to any investment decision here. Seek professional financial advice before choosing to invest. As can be seen from Macquarie’s projections out to 2019, there could be considerable upside in the remainder of 2017 and throughout 2018 with current levels even sustainable into 2019 according to the broker’s forecasts. Macquarie’s forecasts are based on US dollars per tonne. Zinc is currently trading just below US$2600 per tonne, and Macquarie expects this to increase to nearly US$3000 per tonne by the third quarter of 2017, before increasing further to an average price of US$3100 per tonne in 2018. It is worth noting that the broker is also expecting lead to increase from its current levels of circa US$2170 per tonne to an average price of US$2525 per tonne in 2018, implying upside of approximately 16%. This mix of long-term historical performance and medium-term projections suggest the share price gyrations of some companies based on day to day or even month-to-month commodity price movements is flawed. Harking back to five-year historical performances, as can be seen below, zinc and lead have substantially outperformed nickel and copper. Based on a potential continuation of this trend and bearing in mind Macquarie’s projections, FinFeed has identified eight stocks that provide investors with exposure to zinc. As lead mineralisation is often present where zinc is identified, most of the companies we examine are also benefiting from exposure to that metal. Argent Minerals (ASX: ARD) is focused on the expansion and development of its existing base and precious metal projects in New South Wales, as well as pursuing other significant projects. 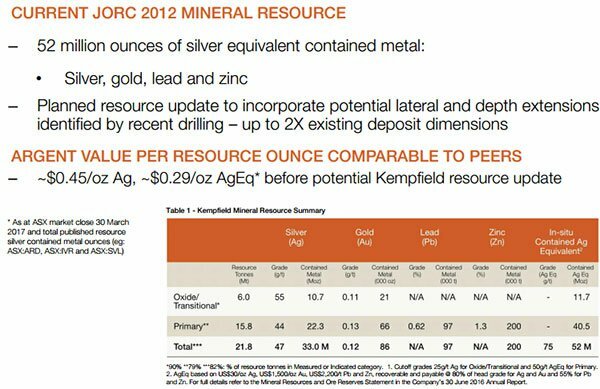 While the company is more of a diversified precious and base metals play, its Kempfield silver-gold-lead-zinc project located in New South Wales has an established JORC 2012 resource as outlined below. A resource update is planned, and with the current value per resource ounce attributed to the Kempfield project in line with its peers, an upgrade could trigger a share price rerating. 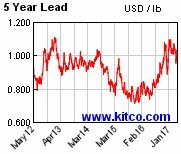 Shares in Longford Resources (ASX:LFR) (formerly Ram Resources – ASX: RMR) have increased substantially since the company negotiated an agreement to acquire an 80% interest in the Keel zinc project located in Ireland on territory adjacent to a number of the largest zinc producing projects in Europe. While the company’s shares are still up 50% on the price prior to announcing the decision to acquire the Keel project, the current price of 4.5 cents implies a significant retracement from the March high of 7 cents, perhaps representing a buying opportunity. Of course share trading patterns should not be used as the basis for an investment as they may or may not be replicated. Those considering this stock should seek independent financial advice. Management recently announced that its drilling program had just commenced with the first seven diamond drill holes aimed at confirming known mineralisation. LFR is looking to grow and upgrade the current inferred resource of 6.9 million tonnes grading 5.6% zinc and 0.8% lead. With an established resource under its belt, vast expanses of known mineralisation, and a data bank gleaned from 268 historic drill holes featuring 250 occurrences of zinc grades in excess of 2% across 40,000 metres of ground, LFR has an attractive advantage in terms of establishing a strategically focused drilling campaign. Though Overland Resources (ASX: OVR) has mining assets in Canada and Australia that span a diverse range of minerals, it is the group’s zinc-lead project in Canada that is currently in the spotlight. The Yukon Base Metal Project (YBMP), which has a current JORC 2012 compliant resource of 12.6 million tonnes grading 5.3% zinc and 0.9% lead has been the subject of an independent review in relation to the prospect of bringing it into production due to a better pricing environment for those commodities. 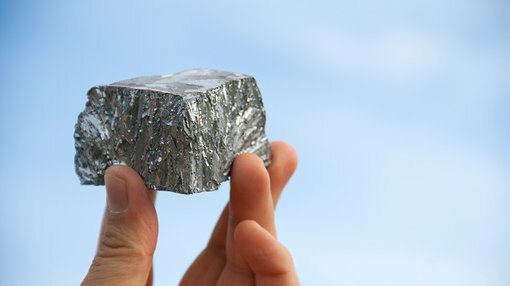 A significant appreciation in zinc and lead prices over the last 12 months has played a substantial part in potentially improving the project’s economic viability. Taking into account the combined impact of currency movements and commodity prices since 2012, OVR highlighted the fact that zinc and lead are now fetching prices that are 210% and 157% higher respectively. By adopting a different approach to mine size and development, management expects to further improve the project’s economic viability. The company is also considering the prospect of integrating with other mining infrastructure and/or existing resources in the district. PNX Metals (ASX:PNX) recently updated the total Mineral Resources at its Hayes Creek Project containing the Iron Blow and Mt Bonnie zinc-gold-silver deposits, which are located in the Pine Creek region of the Northern Territory. This takes into account a new mineral resource estimate at the Iron Blow deposit. The combined mineral resource for the two deposits as outlined below features robust zinc and gold grades of 10.93% zinc equivalent or 8.47 grams per tonne gold equivalent. The Hayes Creek project now hosts total indicated (84%) and inferred (16%) mineral resources of 4.1 million tonnes of precious and base metals which represent 445,000 tonnes of zinc equivalent or 1.11 million ounces of gold equivalent. Near-term share price catalysts include the completion of the Prefeasibility Study (PFS), which could be released as early as June. The PFS will expand on the Scoping Study completed in March 2016, which found that mining and processing ore extracted from the proposed open-pit and underground operations at Hayes Creek would generate strong financial returns for PNX. PNX has conducted two drill programs at Iron Blow since late 2014, with a 30-hole reverse circulation and diamond drill program spanning more than 5000 metres being completed in early January 2017. It should be noted here that LFR is a speculative stock and investors should seek professional financial advice if considering this stock for their portfolio. Commenting on the significance of the resource update in terms of the broader Hayes Creek project, PNX Managing Director James Fox said, “The completion of this favourable Resource update at Iron Blow is another important achievement in the development of the Hayes Creek Project which now contains over 1.1Moz gold equivalent with more than 84% of the mineral resources having been categorised as Indicated”. Drilling has delineated two main massive sulphide lodes. An eastern hanging-wall lode is defined by its significant zinc-gold-silver-lead mineralisation, and underneath lies a broader predominantly zinc-gold rich western footwall lode. Consequently, PNX provides significant exposure to zinc and lead, while also providing leverage to gold which could be beneficial if prices respond to safe haven buying in a risk averse environment. in late April, Peninsula Mines (ASX: PSM) informed the market that it had identified additional high grade silver-gold-zinc mineralisation from quartz-sulphide veining located directly south of the historical Chilbo workings on the company’s Ubeong Zinc-Silver Project in South Korea. Management views the latest results as potentially pointing to a high grade zinc-silver prospect. In addition to rock chip sampling, detailed soil sampling has recommenced over the faulted Chilbo workings area at 100 metre by 25 metre spacing, and extended to cover the recently identified high grade silver-gold zone. Initial soil sampling results included up to 2.1% zinc close to an area of workings (previous channel sample results including 2m @ 29% zinc), as well as a broader 100 metre wide polymetallic anomaly of more than 1,100ppm zinc, with supporting copper, lead, silver and other elemental analyses, that is associated with minor workings only. While at an earlier stage than most of the other companies featured, PSM is one to watch as it works towards gaining a better understanding of the Ubeong project. On April 27, Venus Metals Corporation (ASX: VMC) informed the market that it had identified thick high-grade zinc mineralisation at shallow depths at its Pincher well zinc-copper prospect located 600 kilometres north-northeast of Perth. The Pincher Well Volcanogenic Massive Sulphide (VMS) trend forms part of VMC’s Youanmi gold and base metals project. The tenements hosting the trend are situated 15 kilometres south-west of the Youanmi gold mine and processing plant. As there are historical and ongoing mining operations in the region, including those at Windimurra and Sandstone, the region is well serviced in terms of infrastructure. The trend covers more than 5 kilometres of strike and hosts a number of known zinc and copper prospects including the Linda and Franca Gossans PW17 zinc discovery and a substantial body of zinc mineralisation at North Dome. Drill results included 10 metres at 7.31% zinc from 52 metres including 6 metres at 9.5% zinc from 55 metres. There were other impressive intersections including 7 metres at 4.2% zinc and 10 metres at 5.1% zinc. Reconnaissance drilling confirmed the presence of significant thick, shallow, ‘up-dip/plunge’ extensions to the south of the known North Dome zinc-copper mineralisation. Importantly, mineralisation remains open along strike and at depth and appears to be projecting to surface to the south towards the ‘Linda Gossan’. In view of the highly promising nature of these results, VMC is undertaking an accelerated exploration program which will include additional geophysical surveys and drilling in order to continue to delineate the high grade zones of zinc mineralisation along the highly prospective southern extensions of the prospect. On April 26, White Rock Minerals (ASX: WRM) released its maiden independent JORC 2012 Mineral Resource estimate for the Red Mountain project located in a highly prospective region of Alaska, 320 kilometres north of Anchorage. Since announcing the news, WRM’s shares have traded 14% higher, but still appear to reflect a significant discount particularly given the company also has a relatively advanced gold-silver project in northern New South Wales. The mineral resource estimate relates to WRM’s Dry Creek and West Tundra Flats deposits, which are part of the Red Mountain project. One of the most important takeaways was the sizeable high grade inferred mineral resource of 9.1 million tonnes grading 12.9% zinc equivalent for 1.2 million tonnes of contained zinc equivalent at a 3% zinc cut off. The total inferred mineral resource of 16.7 million tonnes grading 8.9% zinc equivalent for 1.5 million tonnes of contained zinc equivalent at a 1% zinc cut off for Dry Creek, 3% zinc cut off for West Tundra Flats and 0.5% copper cut-off for the Dry Creek copper zone highlights the fact that Red Mountain is a quality base and precious metal asset. It should also be noted that mineralisation commences at surface and is open down dip. The Mineral Resource places the Red Mountain project in the top quartile of undeveloped high grade volcanogenic massive sulphide VMS (zinc, silver, lead, gold, copper) deposits globally. Base and precious metal content includes 678,000 tonnes of zinc, 286,000 tonnes of lead, 53.5 million ounces of silver and 352,000 ounces of gold. The cut-off grade was calculated to report the Mineral Resource contained and to demonstrate reasonable prospects for eventual economic extraction. A 1% Zn cut-off was used for Dry Creek in consideration that sufficient grades are obtained for the combined elements with a likely open pit mining method. A higher cut-off grade of 3% Zn as indicated below was used for West Tundra Flats in consideration of the likely underground mining scenario. Commenting on the release of the maiden resource and reflecting on the implications for the broader project, WRM’s Chief Executive Matt Gill said, “Establishing a Mineral Resource estimate for the two deposits at Red Mountain underpins our belief that the Red Mountain project can be home to a new camp of high grade zinc-silver-gold VMS deposits”. WRM is now preparing a program to advance its understanding of the project, focussing on the already defined geophysical targets that exhibit the same signatures as the two zones that have already been drilled. Following the successful completion of Zinc of Ireland’s (ASX: ZMI) maiden drilling program late last year, Phase 2 diamond drilling commenced at the Kildare MVT Zinc Project in Ireland in mid-March. One of the key features of the maiden drilling program was the particularly thick intersections. As can be seen below these were also accompanied by solid grades which were intersected from surface to more than 400 metres. The results from McGregor and Shamrock reinforced the significant potential of the Kildare project and are the forerunner to what is shaping up as a potential highly promising Phase 2 drilling program. This is, however, still an early stage play and investors considering this stock for their portfolio should seek professional financial advice before making an investment decision. This will comprise approximately 3,000 metres of diamond drilling designed to test multiple targets, including extensions of mineralisation at previously drilled prospects and a number of newly identified high-priority exploration targets. The number of holes will depend on the mineralisation encountered in the target horizons, while an in-fill hole will also be drilled at McGregor to test the eastern extent of the mineralisation to assist with the potential calculation of a maiden JORC (2012) compliant Mineral Resource. A number of newly identified greenfield exploration targets where management believes there is significant potential to make new discoveries will be tested. This could prove to be an interesting phase of the drilling program given management’s success in first phase drilling when it successfully ventured beyond historical data. ZMI has already demonstrated its ability to look outside the square in terms of considering the prospect of new targets. Its decision to undertake deeper drilling in its Phase 1 program paid dividends, and the full rewards of that initiative should come to light in coming weeks.